The restored frescoes on the ceilings hover above priceless treasures. The 16th-century poetry that sprung from Savona made a strong impression on Thomas William Parsons when he found verses inscribed on a statue of the Madonna near the town’s lighthouse during a tour of Italy in the 19th century. He was so moved, the American poet penned the sonnet “Savona: Vespers on the Shore of the Mediterranean” that included the Sapphic verse in Italian as a refrain. Though Savona’s most famous former resident was not involved in the arts—that distinction is said to go to Christopher Columbus—the town obviously felt proud enough of Chiabera’s poetry to have honored it with such a public display. This attitude has not changed during the intervening centuries, and Savona continues to be a hotbed for creativity, especially where Ligurian ceramics are concerned. 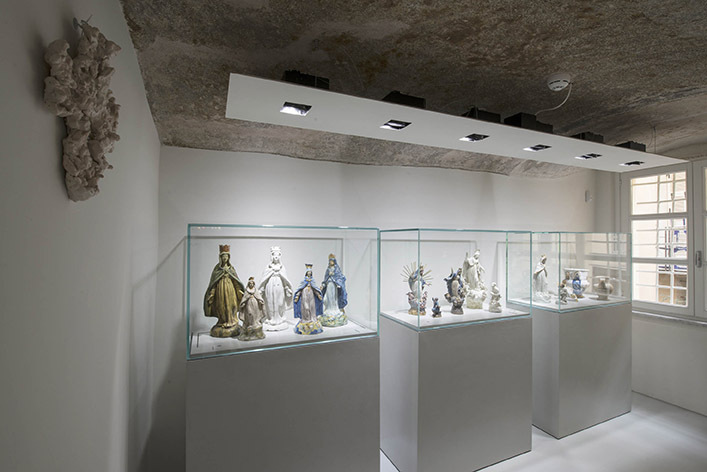 Support for this art-form gained an uptick this past December with the opening of the Museo Della Ceramica, which that holds more than six centuries of significant ceramics. Given it has only been open for three months and it is already being called one of the most important ceramics museums in the world, the town’s leaders are right to be proud of what they’ve accomplished. The venue would not have been possible were it not for a collaboration between the A. De Mari Foundation and the Municipality of Savona, which sits squarely in Liguria, a region considered among the most important ceramic-producing areas of the Mediterranean (and known for its seafaring heritage, as well, of course!). A ceiling at Museo della Ceramica in Savona, the fresco carefully restored. Its coastal plains stretch from the Ligurian Sea all the way to France to the west, to the Piedmont to the north, and to Tuscany to the east—the towns of Savona and Albisola particularly significant to the history of Italian ceramics. The museum is housed in the Palazzo del Monte de Pieta, which was built by Pope Sixtus IV in 1479. 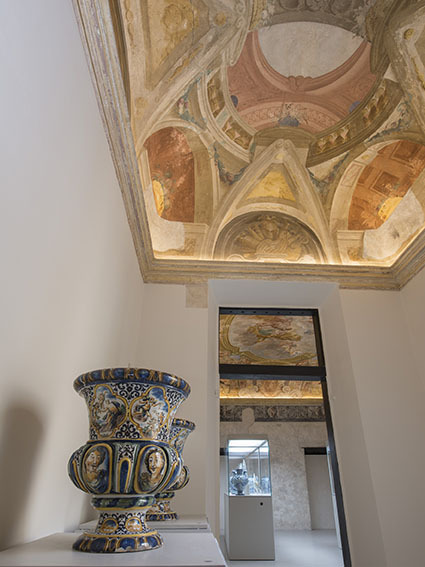 It has been restored and renovated to serve as the ceramics museum, the restoration project owing its success to Armellino & Poggio Architetti Associati, Studio di Architettura Fallucca and architect Marco Ricchebono. It was Ricchebono who adopted the architectural solutions meant to preserve some of the building’s original interiors, the most visually stunning being the ceiling frescoes. Adding contemporary architectural elements, such as structures in steel and glass that serve as display cases for the museum’s priceless contents, was another deft move. 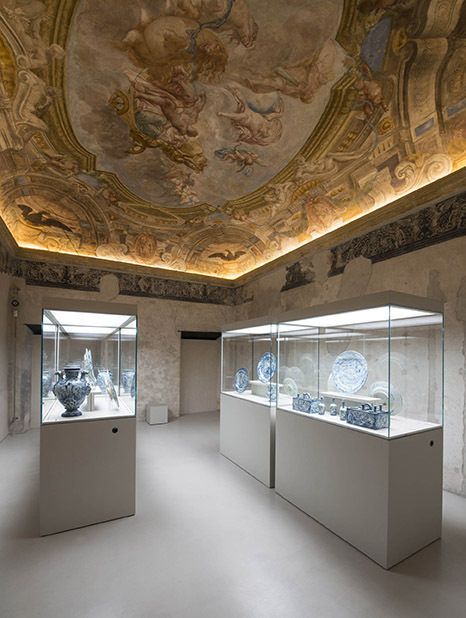 The treasure trove contained within the exhibition spaces dedicated to Ligurian ceramics includes a breathtaking array of remarkably well-preserved objects d’art dating back to the 15th century and segueing forward to modern times. 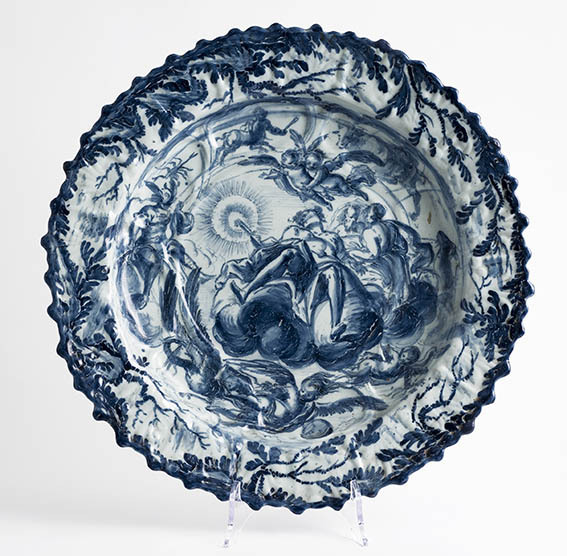 The spectacular examples of majolica and blue and white specimens are particularly phenomenal, and my favorite pieces of each are attributed to 17th-century Italian painter Bartolomeo Guidobono, also a native son of Savona. Sottocoppa Majolica, attributed to Guidobono Buidobono, at the Museo della Ceramica. He began his career as a painter of ceramic earthenware alongside his father, who was a ceramicist for the royal court of Savoy. He then traveled to Parma, Venice, and Genoa as a copyist, reportedly quite a busy man as he crisscrossed the country and enjoyed being admired for his ability to paint flowers, fruits, and animals in a beautifully ornamental way. But his talents spanned beyond ceramics to frescoes and paintings. He was among a team of painters who created the fresco in the Palazzo Centurioni in Genoa, and he painted the Inebriation of Lot and other works within the palace Brignole Sale. Piatto Reale attributed to Guidobono Buidobono. Along the way he acquired the nickname il Prete di Savona, the priest of Savona, though none of my research could answer why. I suppose he spent enough time in Italy’s Duomos, his eyes and hands worshipfully ornamenting the ceilings, to qualify, but I suspect there is a deeper story here. If anyone knows the answer, please fill me in, would you? He certainly knows how to inspire an almost religious level of fervor for his ceramics in this design devotee who has always adored majolica, and his painting below is such an emotive work that it is obvious he felt great love for his art. Vaso Biansato Majolica, attributed to Guidobono Buidobono at the Museo della Ceramica. I often wonder how it would have felt to be alive during a time when there was so much romanticism in the arts but the hour has long passed. 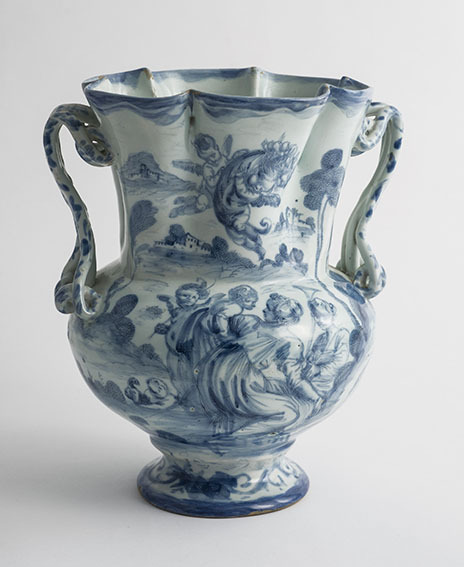 I suppose I will have to satisfy my craving for such beauty through the artifacts that survive—poems by Chiabrera and Parsons, and alluring ceramics displayed at the Museo Della Ceramica. This stanza from Parsons’ sonnet seems fitting as an homage to both the building and the ceramics held within the museum, don’t you think? Those lifelike seraphim would start and fly! Will worship, anthem-winged, ascend most high. 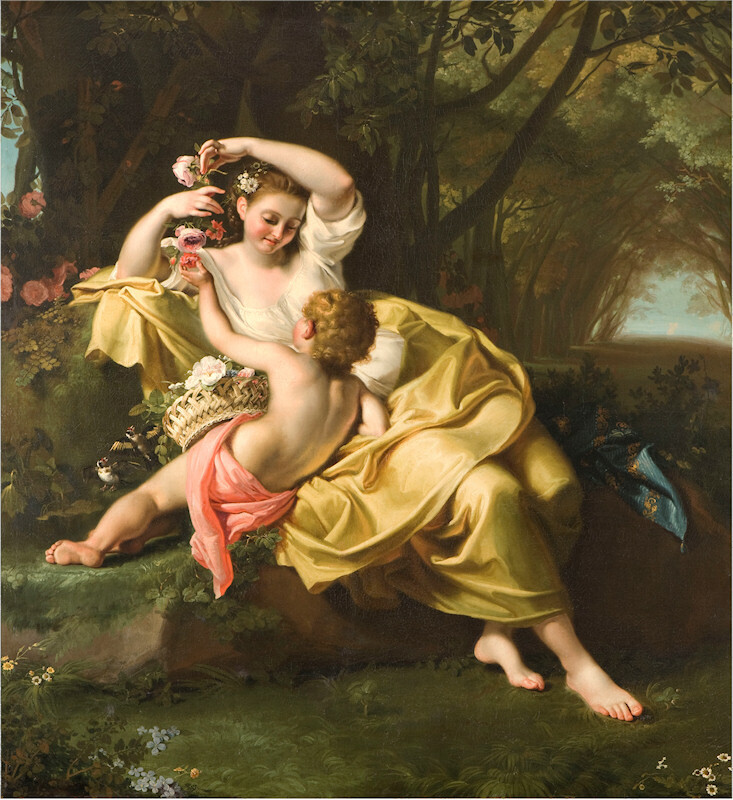 Guidobono Bartolomeo’s “Allegoria della Primavera,” courtesy of Artgate Fondazione Cariplo. Savona is now solidly on my bucket list, as any town with such a fine artistic heritage must be a terrific place to visit. 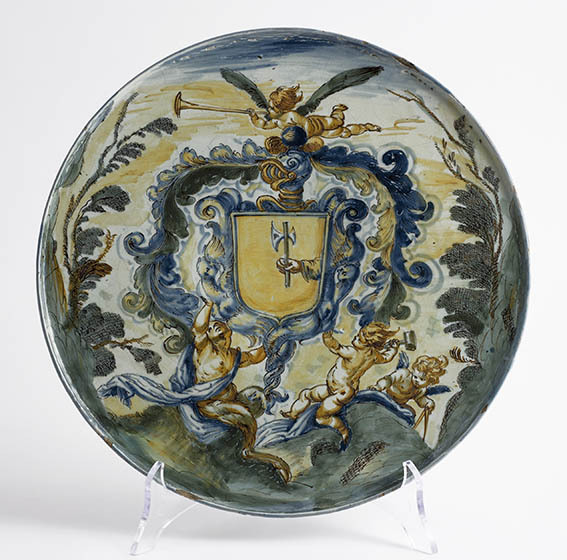 You can bet I will be stopping by the ceramics museum, which is connected to The Palazzo Gavotti, home to the Pinacoteca Civica of Savona that houses art from the 14th century. Also in town is the Museo d’Arte di Palazzo Gavotti that holds the Renaissance masterpiece Donato de’ Bardi’s Crucifixion, and works by greats like Picasso, Fontana, De Chirico, Magritte and Mirò. It’s too bad my April trip to Milan will not allow enough time for me to trek to see artifacts like these within such an historic setting. I guess that means I’ll have to go back to Italy (and you’ll hear no complaints from me on this measure)! It was a Madonna statuettes of a much larger size that fascinated another American poet centuries ago. Because these beautiful works of art are ones I’d love to own, I’m including this entry in my Living with Art series. The Modern Salonnière and Poetry and Ceramics in Savona, © Saxon Henry, all rights reserved. Saxon is an author, poet and journalist whose books include Anywhere But Here, Stranded on the Road to Promise and Four Florida Moderns.